Azarga Metals Completes Successful | Azarga Metals Corp.
AZARGA METALS CORP. ("Azarga Metals" or the “Company”) (TSX-V:AZR) announces it has completed a ground magnetic survey at its Unkur Copper-Silver Project in the Zabaikalsky administrative region in eastern Russia, with successful results. identified targets for additional mineralization to the north of the first phase drilling area. The magnetic signatures of these targets remain open to the northeast and future surveys will aim to extend them. 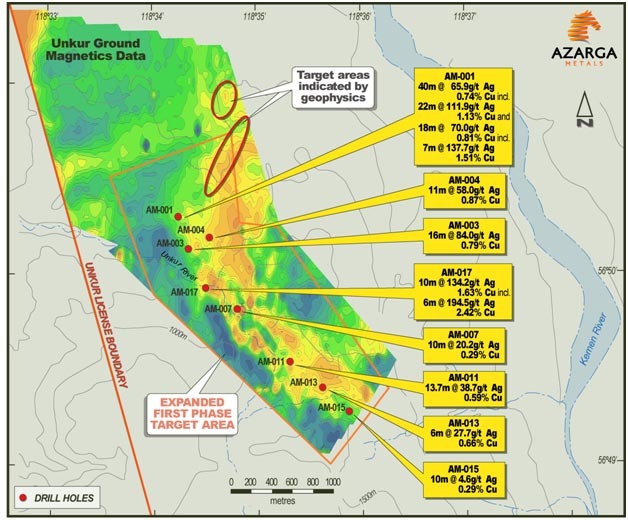 Drilling results from Azarga Metals’ first phase exploration program at Unkur intersected significant copper-silver mineralization over a strike length of approximately three kilometers and the mineralized area remains in open in all directions as well as down dip. The newly acquired ground magnetic survey data will be used to plan drilling in the second phase exploration program with the aim to expand the mineralized area and target zones which are indicated to be thicker and higher grade. See below image of ground magnetic survey results with some selected drill-holes overlaid and highlighting on the map future targets from the mag data. On January 16, 2017, the Company issued a total of 107,934 common shares for $22,666.66 services rendered to the Company by the non-executive directors for the period October 1, 2016 to December 31, 2016. The shares were issued at the closing price on December 31, 2016 of $0.21 per share and are subject to a four-month hold period expiring on May 17, 2017. Azarga Metals is a mineral exploration and development company that owns 60% of the Unkur Copper-Silver Project in the Zabaikalsky administrative region in eastern Russia.